Many things you can do with rtl-sdr require piping the audio from SDR# or another software radio receiver into another program which is used to decode the audio. In Windows this can be achieved with stereo mix. This tutorial will show how to enable stereo mix. 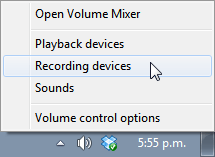 Right click the speaker icon in your task bar and click on “Recording devices”. 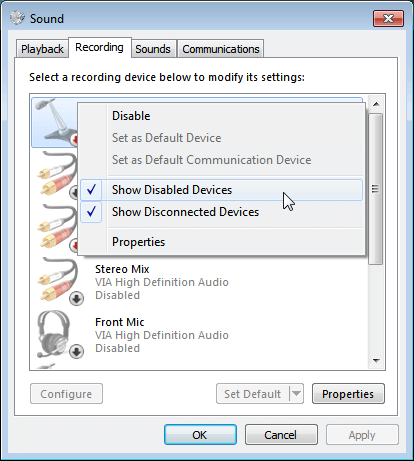 Right click anywhere in the window that pops up and ensure that “Show Disabled Devices” and “Show Disconnected Devices” are both checked. Find the “Stereo Mix”, right click it and select Enable. 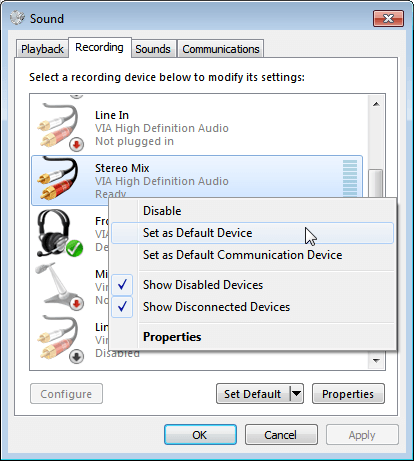 If you have more than one recording device, such as a microphone, or you have also installed virtual audio cable make sure to set stereo mix to the default device. 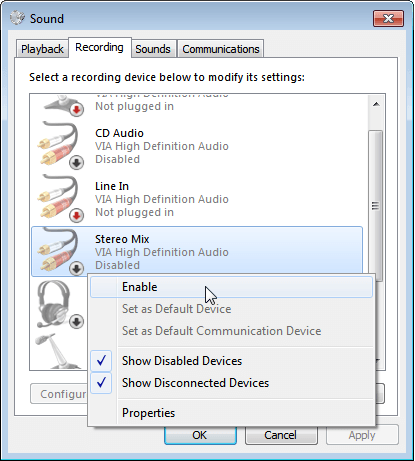 Many programs will select the default device only when looking for an audio source. Note that if you want to use virtual audio cable again, you will need to set it back to the default device. Now stereo mix is enabled and ready to use! Any audio coming through your speakers will also be piped to stereo mix which can be selected as an audio source in most programs that require one. If stereo mix is not showing up in the recording properties window, try updating your sound card drivers. This does nothing. All the solutions I can find say to do this and nothing changes.